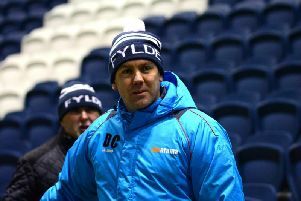 Fylde twice took a two-goal lead but on both occasions were pegged back and the National League high-flyers ultimately needed a late Andy Bond equaliser to secure a replay at Mill Farm. The Coasters fielded a strong, attacking side, featuring Danny Rowe and Nick Haughton, with Manchester United loanee Tom Sang making his debut. The lively Haughton caused the Rams trouble early on and Fylde took the lead after just 10 minutes, when a low cross was converted by Serhat Tasdemir, giving keeper Sam Ashton no chance. The tie had been frozen off on Saturday and this time it was heavy rain which forced a pitch inspection which the surface passed. The driving rain and howling wind during the match didn't diminish Haughton's quality and he doubled the lead with a sublime finish, gliding past three defenders before curling the ball into the bottom right corner from the edge of the box on 34 minutes. The hosts responded and a crazy three-minute spell saw them draw level. Close range strikes from Luke Thompson and Nic Evangelinos shellshocked the Coasters but there was still time before the break for a fifth goal. On the stroke of half-time, a superb cross from the right from Timi Odusina was headed home by Jordan Tunniciffe, beating Ashton to the ball from 10 yards to restore Fylde's advantage. Sixty seconds after the break Fylde doubled their lead for the second time. Some poor defending from the hosts allowed Tasdemir to steal possession and stroke the ball into an empty net for his second. Ramsbottom weren't finished, though, and it was Evangelinos once again who struck on the hour. 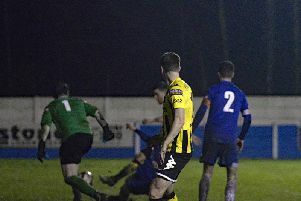 A long ball over the defence was pounced on by the forward, who rounded keeper Russ Griffiths and slid the ball home just before Neil Byrne could cover. That made it 4-3 and with the pitch cutting up badly the hosts equalised again on 71 minutes. A ball over the top found Ryan Ellison, who played it back for substitute Ruben Jerome, and he somehow slid the ball beyond Griffiths to the delight of the partisan home crowd. And the home side looked to have won it seven minutes from time, when Evangelinos completed his hat-trick. But there was still to be a final twist as a low cross by substitute Sheldon Green reached Bond, who fired home from close range at the back post. Five minutes of injury time could not produce a winner in a classic cup-tie and the sides must replay to determine who hosts Carshalton Athletic or Barnet in the quarter-finals. The last-eight is starting to take shape, with Solihull Moors and Telford United winning through last night. Fylde: Griffiths, Odusina, Tunnicliffe, Byrne, Francis-Angol, Sang, Crawford, Bond, Haughton, Tasdemir; subs used: Croasdale, Philliskirk, Green.